The stock market took a plunge this past week after the Fed minutes revealed renewed concern over economic growth. The markets had been stalling near important resistance levels, and Wednesday’s gap lower left a lot of damage in its wake. This week’s reversal could prove to be a pivotal turn in the markets, as there is potential that a much larger top will form on the weekly charts. The rally that began in March has retraced about two-thirds of the decline that occurred through the financial crisis. With the markets stalling in this area, some are thinking another bear market could be unfolding. While this theory should not be dismissed, it is still much too early to assume anything more than a pullback is occurring. The case can be made for multiple scenarios and traders are probably better served standing aside until the picture becomes clearer. 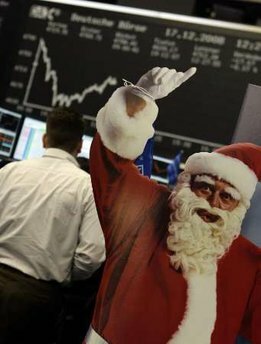 The Dow Jones Industrial Average brought good tidings to traders by gaining over 7% for the month, marking its largest monthly advance in a year. The S&P 500 and NASDAQ gave traders a present of their own, each adding 6.9% for the month and closing above their 10-month trend lines. The earnings parade brought mostly positive surprises for traders to celebrate overshadowing lackluster economic data suggesting a slow recovery. After three straight days of triple-digit gains the bulls took a breather on Tuesday failing to break through well-established resistance near the June highs. The S&P 500 (SPX) will begin the week just below stiff resistance between 1115 and 1120, a technically significant level that proved difficult to break for several weeks in late 2009. Moreover, 1,117 is the site of the SPX’s June closing high, and 1,115.10 is the site of 2009’s close. Research indicates that the index’s level at the beginning of the year can act as support or resistance for the market. Statistics reveal an average loss of 1% in the month following the respect of such resistance levels. However, a penetration of the 1117 could propel the market higher, catching bears off guard. A failure of last week’s low of 1064 could result in the testing of the July low of 1022. Though July was a good month for the markets, it wasn’t so kind to our model portfolio which closed at $1,558,075. Our newer account fared much better closing at $2,029,720. For the second consecutive session, gold futures skyrocketed to a record, closing at a price of $1,258.30 an ounce after touching an all-time intraday high of $1263.70. For the week, gold advanced 2.3%, marking the commodity’s fourth straight week-over-week advance. 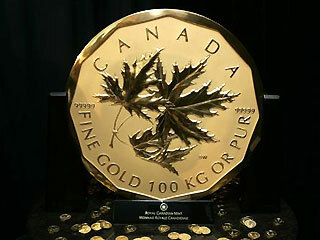 Great timing for the issuance of Canada’s new one million dollar gold coin, the world’s biggest, purest and highest denomination coin (pictured above).”Gold is looking for any and every opportunity to go higher, and we all know the reasons why — the safe-haven factor, sovereign debt risks and so on,” said Peter Hillyard, head of metals sales at ANZ Investment Bank. Analysts are predicting gold prices between $2500 and $3000 over the next 18 months. “People are tired of their zero percent T-bills, afraid of the stock market, and afraid of the double-dip recession,” said James Cordier, a portfolio manager at OptionSellers.com. Reuters reports weaker U.S. economic data and a rise in unemployment benefits last week also drove anxious investors to return to gold as a safety play. Equites have proven their resilience, however, as the Dow Jones Industrial Average pushing back above 10,400 to close Friday with its second consecutive weekly gain. Additionally, the S&P 500 closed above 1,100 for the first time since mid-May. The tech-rich NASDAQ index fared the best of the three, adding 3% for the week. All this, despite a downgrade of Greece’s debt to junk status, the steepest monthly drop in home construction in decades, another disappointing jobs report, sluggish manufacturing data, and another week excuses from BP plc (BP). The government reported single-family home construction fell 17% in May while applications for building permits dropped 5.9%. AP reported that the number of people filing new claims for jobless benefits jumped last week after three straight declines, another sign that the pace of layoffs has not slowed. Initial claims for jobless benefits rose by 12,000 to a seasonally adjusted 472,000. Meanwhile, consumer prices fell for the second straight month. Meanwhile, BP suspended its dividend and Government-sponsored mortgage purchasers Fannie Mae and Freddie Mac plan to delist their shares from the New York Stock Exchange. The CBOE Volatility Index (VIX) declined during the past week, from 28.79 to 23.95 by Friday’s close. With SPX 20-day historical volatility at 26.96, this would suggest volatility is still headed lower, a bullish sign for stocks. The risk is that if volatility is trending higher from a longer-term perspective, the current “pullback” in volatility could end here. If the VIX rises back above 25, the market rally could fizzle. Wednesday’s Federal Open Market Committee’s interest rate decision will be the first big news in the coming week until Friday’s third-quarter GDP is released. The ongoing concern about the euro zone debt crisis will continue to be at issue. The low-expectation investing environment may reduce “headline risk” and give the bulls the edge over the next few sessions. We taken the hedge off of our model portfolio which closed Friday at $1,694,454, while portfolio#2 finished at $1,747,721. There was a time that I loved the anticipation, maybe the pure adrenaline, while sitting in the first car of the rollercoaster climbing that initial hill just before the big drop… click…click…click…click… The old wooden ones always had the soundtrack of clicks all the way to the top, then in an instant, we would be falling at what seemed like the speed of sound, with our arms in the air, screaming at the top of our lungs, winding around turns, climbing shorter hills and dropping again and again and it never lasted long enough. Come to think of it, I still love rollercoasters when I’m at an amusement park. I bet many of you feel the same way and may have even experienced it this past Memorial Day weekend. Those modern coasters are quite a different experience, much wilder than when I was a kid. 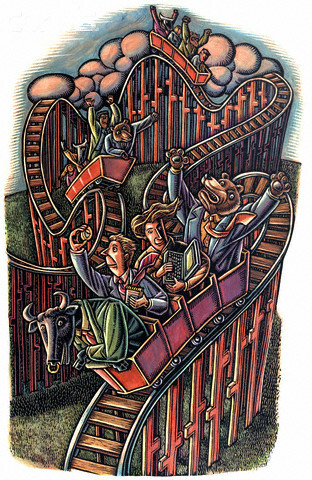 The stock market felt a lot like one of those new rollercoasters for the entire month of May. And what a ride it was. We had a “Flash Crash”, followed by a 400-point rally, more than a few highly volatile days, followed by another 300-point rally. Worries from the Euro-zone, sabre rattling by the Koreas, and the biggest oil spill in history each provided major curves in the track, making for one wild ride. We went an entire month without two straight up days. By the close of market on Friday the Dow was down another 122 points , had lost over 1000 points during the month and had turned in its worst May performance since 1940. I’m sure many traders found the volatility exciting and profitable, while others felt that queezy feeling in their stomachs like they just got off the Big Dipper after eating half a pizza. When all was said and done, the Dow lost 7.9% for the month. Though market technicals have lost some ground, there is some solace in that the Dow held above the emotional 10,000 level and some analysts see the potential for a bounce. The fact that the major indices held their February lows may be setting up a traditional double bottom. additionally, sentiment readings show the number of bears has risen to levels not seen since last November, just before the Dow climbed 1000 points. Though there are some encouraging signs, the fact remains that the S&P broke below its 160-Day Moving Average in May, which is a bearish signal. It would be wise hedge long positions and keep your eye on the VIX and the dollar for clues as to the what’s next for equities. Our hedged account has outperformed, as is to be expected, closing May at $1,612,877 vs. $1,539,496 for the unhedged account. Go to http://optionsprofitzone.com for your FREE report entitled “7 Secrets to Making Money in Bull or Bear Markets”. 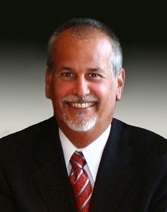 My friends at Schaeffer Research always do a good job explaining the technical aspect of stock market performance and this week’s Monday Morning Outlook does an exceptional job, so I decided to use excerpts for this week’s blog. Please enjoy! I always find Schaeffer’s report enlightening and I hope this week’s analysis helped you. I’ll see you again next week. Black Thursday’s action did come in a flash. After the market seemed to be having an average down day of 250 points or so, suddenly it was down 1000 and minutes later was back up and eventually closed down 348. It had dropped 283 points in the previous two days and by Fridays close, the Dow Jones had erased its entire gain for 2010, a 7.3% correction from the peak of 11,205 on April 26th. Over $1 trillion in U.S. stock market value has been lost in the downturn. Though there has been rampant speculation and numerous rumors of a computer glitch or other missteps causing the wild ride, federal investigations have not proven that a single culprit was to blame. A Congressional hearing is scheduled for Tuesday to continue the hunt for errant activity. Citigroup analyst, Tsutomu Fujita, justified the move stating that it would be “only natural to go through a correction of around 10% or 20% over two or three months.” Many others have felt a correction of this nature was overdue and was inevitable, at some point. To be sure, the sovereign debt crisis in Greece, not to mention Spain and Portugal, has weighed heavily on the confidence in the Euro and has become an excuse for traders all over the world to reduce risk exposure. This has led to a sell off in every major equity index across the globe. In turn, the flight to quality has lifted the U.S. Dollar and U.S Treasuries to highs not seen in many months. Gold, too, saw its share of popularity, reaching a five-week peak of $1210 per ounce, ignoring the ascent of the dollar. The CBOE volatility Index (VIX) was another benefactor to last week’s events, climbing to an annual high of 42. As a result of the strong dollar, crude oil tumbled to $75 per barrel, marking its largest weekly decline since December 2008. Key support for the Dow lies at 10,000, with support for the S&P 500 and NASDAQ at 950 and 1900, respectively. The good news is that a Eurozone bailout package was finally approved after the close on Friday, which should give strength to the Euro and bring a degree of confidence to equity markets. Expect a strong opening on Monday morning in response. The S&P will begin the week above its February low of 1050 and remains above its 200 day moving average, which has provided support in the past. But last week’ s event should be taken as a warning and investors should proceed with caution until the VIX begins to decline into more friendly territory, which lies beneath 25. A complete correction of 10% or better has not been completed and may be the end result of the current trend. If you decide to take advantage of potential buying opportunities, you may want to consider buying put options as insurance against a continued decline. As to be expected, our managed portfolios lost ground last week with the hedged portfolio closing at $1,567,076 and the unhedged account coming in at $1,534,604. A late session push by the Bulls nudged the Dow Jones Industrial Average just above the 11,000 level before settling in for a 10,997 close. This was the highest apex for the blue chip index since September 29, 2008. The S&P 500 and NASDAQ Composite followed suit achieving new annual highs to close the week at 1194 and 2454, respectively. Fed comments about an improving economy, bringing into question the possibility of interest rates, threatened to continue the previous week’s pattern of failed attempts to hold above 10,900, but upbeat news on Thursday and Friday brought renewed enthusiasm, leading to an upside penetration of resistence. A record-setting 9.1% surge in retail sales and a possible merger between United Air and US Airways began the rally on Thursday. Friday’s wholesale sales report and a positive outlook from Chevron continued the pace that led to the Dow’s penetration of the millennium marker. (Note – The Dow first penetrated 11,000 in July 1999) Momentum is clearly on the side of the Bulls driven by institutional buying who can protect long positions with by purchasing put options. Individual investors remain on the sidelines, fearful of the resumption of the Bear market, sustaining a bullish contrarian viewpoint. The Russell 2000 Index of small cap stocks has been on a tear, more than doubling since its March 2009 low. It closed the week above 700, a level that acted as support in 2007 and 2008. The next level of resistence is 750, a level last reached in 2008. Support for the S&P 500 remains at 1150 with resistence at 1200. If the Dow is able to sustain itself above 10,900, an advance to 11,500 would be expected. The week ahead brings the official kickoff of first quarter earnings season. It is unclear whether expectations are dangerously high, which could potentially lead to disappointment, or warranted, given the steady stream of positive economic news. Alcoa (AA), traditionally a proxy for the quarter’s results, will report on Monday. CSX Corp. (CSX) and Intel (INTC) are scheduled to report on Tuesday, with JP Morgan (JPM), Bank of America (BAC), General Electric (GE), and Google (GOOG) scheduled for later in the week. Don’t forget, Tax Day is Thursday, April 15. Data suggests no unusual deviation from current market trends can be attributed to tax day. The good news is, if you owe taxes, you must have had a job in 2009. That’s something to be thankful for in the current economic environment. So Happy Tax Day! (Still seems like an oxymoron?) Hopefully, the rising trend in employment will endure. There’s more good news for our managed portfolios which continue to produce phenominal returns.The hedged account closed the week of April 9 at $1,725,284, with the un-hedged account ending the week at $2,0260148. Learn more about the strategy used to produce outstanding results by visiting our website at http://optionsprofitzone.com. Major U.S. market indexes climbed to new 2010 highs last week reaching levels not seen since before the financial collapse that started in the fall of 2008. Last week marked the fourth straight weekly gain for equities as we approach the end of the first quarter. Boosted by the House of Representative’s passage of a highly controversial health care reform bill, the Dow Jones Industrial Average began the week with a 43 point advance. By the close on Friday the Dow had gained over 108 points, ending the session at 10,836. Helping to sustain the positive tone were Thursday’s weekly jobless claims which fell for the fourth week in a row, and Fed Chairman Ben Bernanke reiteration of the need for an extended period of record-low interest rates. The Dow soared to 10,955 intraday, but gave back much of the gain in late trading, eeking out a meager increase of 5 points. Friday’s action was similar as traders, once again, pushed the Dow over 10,900 after a deal was announced to rescue Greece from its debt crisis, but could only muster a 5 point improvement by the close of business. Short-term momentum favors a bullish stance but overhead resistence levels may prove to be difficult to break through. The week ahead could be boosted by institutional “window dressing” as money managers buy the best-performing stocks and sell the under-performers as they prepare for end of the quarter reporting. Coupled with the fact that April historically delivers the best monthly returns of the year and that bearish sentiment has recently overtaken the bulls (generally a bullish indicator), there is reason for near-term optimism. Conversely, the historically high premium of the CBOE Volatility Index (VIX) relative to the S&P 500 (SPX) indicates there could be rough seas ahead. The late session pullback on Thursday and Friday are symptomatic of a market struggling to break through resistence. If a reversal were to develop, it would be not be expected until after Wednesday’s end of quarter close with potential support at 10,750 for the Dow and 1,150 for the S&P 500. Our managed accounts continue to shine with the hedged portfolio climbing to $1,609,657 and the unhedged account advancing to $1,895,232. Keep in mind, both of these accounts started with $1,000,000 less than one year ago. Visit us at http://optionsprofitzone.com to learn the secrets of professional traders that have helped us achieve these extraordinary returns. Stay informed by following First Wealth, your financial education publication. Last week marked the one year anniversary of the cyclical bull market on Wall Street. It was March 9, 2009 that major stock market indices hit rock bottom, resulting in the destruction of capital not seen since the Great Depression of 1929. The S&P 500 had dropped from its October of 2007 high of 1557 to a low of 676, a loss of 56 percent. The Dow Jones industrial Average fell from its high of 14,093 in October of 2007 to 6547, declining 53.5%. The NASDAQ peaked at 2810 in October of 2007, falling to 1268 by March 2009, a 54.8% decline. With all of the well-followed indices having dropped in excess of 50%, the Bear Market appeared to be in full swing. Some say it began in 2000 and, based on historical data, a new bull market was not to be seen again until 2018. However, within these secular bearish periods, there are always cyclical Bull Markets that traders can take advantage of. Cyclical, in this case, means shorter trends within the longer secular periods. Investors can enjoy above average returns during these cyclical up-trends , which can last 1, 2 or more years in length, before the Bear raises its head again. The question is… has the last year been the return of the secular Bull Market or just a cyclical bullish period within the secular Bear Market that began in 2000. There have been three secular Bear Markets and three secular Bull Markets since 1900. The shorter of the Bear Markets was 16 years, while the longest was 21 years. If history is our guide, it appears that we are in the midst of a secular Bear Market that may continue for several years, though the current cyclical Bull trend may still have some legs. And what a cyclical bull it has been. The major U.S. indices have all gained over 70% in the last year, far more than even the most bullish analysts predicted. Recent history, however, provides evidence that breakouts above strong resistence, though technically bullish, have been short-lived and corrections of 7% to 10% have followed. Friday’s close of 1149.99 is right at the 1150 level considered strong resistence for the S&P 500. An upside breakout will likely be seen in the week ahead, driven by short covering by those who believe that 1150 will now form support, but new investors could be coming late to the party. In the days and weeks to come, it will be important to keep an eye on the CBOE Volatility Index (VIX) for signs of a reversal to the upside, a signal that the market may begin to correct. I’ll keep you posted on any apparent warning signs. All you have to do is watch for my new blog posts. I am happy to report that our model portfolio’s continue to display powerful performance with our hedged portfolio closing Friday at $1,566,908 and our basic portfolio climbing to $1,801,968. Learn how we do it at http://optionsprofitzone.com.